Molly...wow. You're probably tired of hearing me say how much I like berry shades of polish. Add some ultra-sparkly holo and I'm sold. The finish is absolutely gorgeous! This one makes my heart melt. LOL. Next is the holo version of My Little Glacier, an ultrachrome polish. 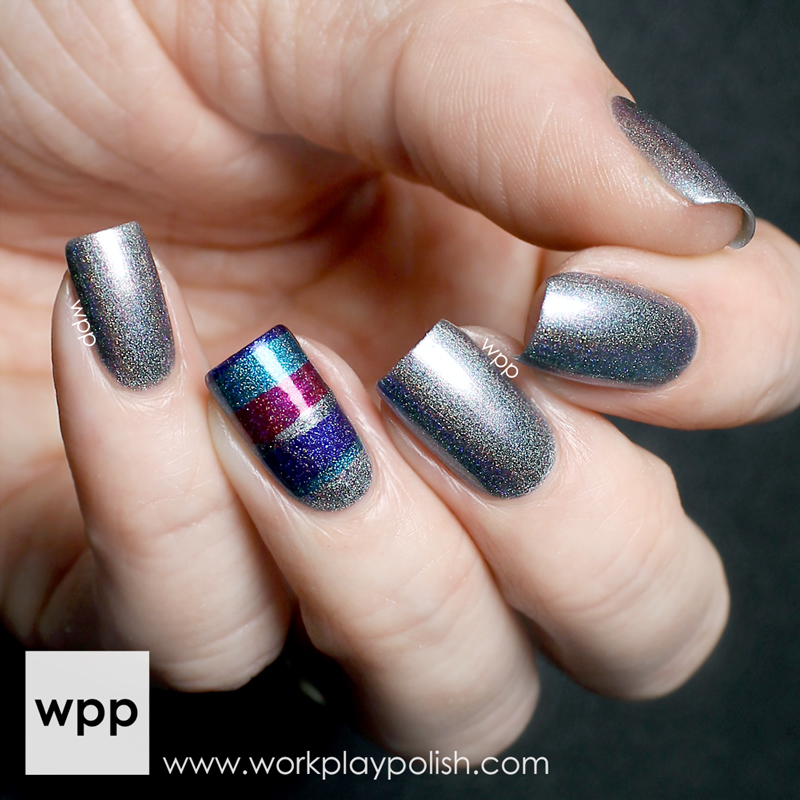 This titanium gray shade shifts to a steely blue and has a rainbow, twinkle finish. I love that it's both unique and blingy, but it's also conservative enough for me to wear it to work. Admire Me is a stunning, bright, clean teal with that signature sparkly finish. Killer, right? And finally, this is Indie Go. 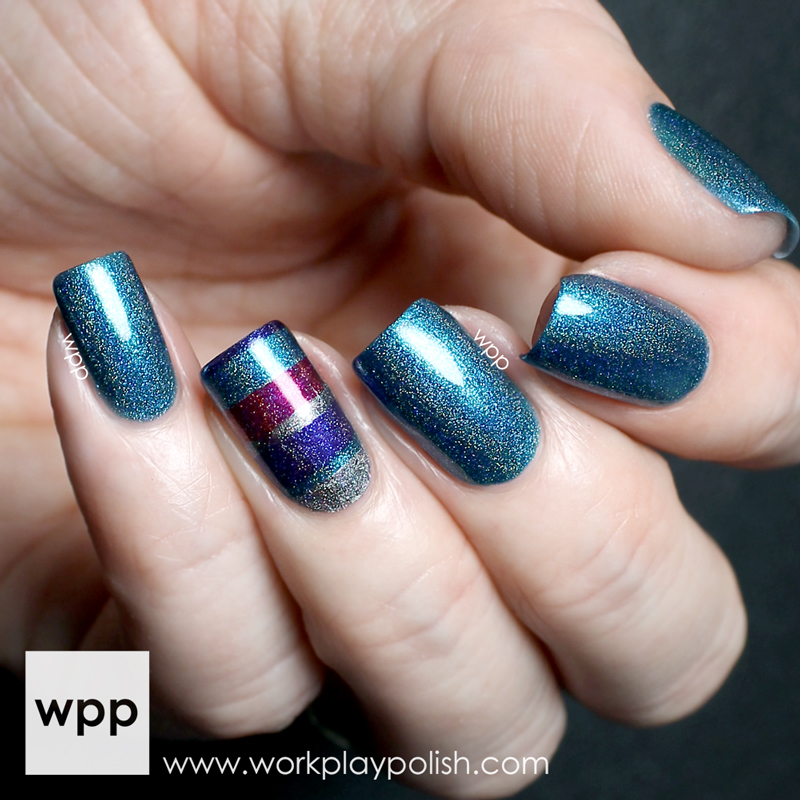 It's a dark, but bright indigo blue with an intense holo effect and more sparkle. This one is crazy in person. The accent finger was done with all four shades and a medium striping brush. All swatches are two coats of polish and one coat of HK Girl topcoat. The formula for each was exactly what I expect from ILNP...flawless! ILNP also just released a special 3-polish Holiday Collection. ILNP nail polish retails for $10 to $12.50 (depending on the finish). You can purchase directly from the ILNP shop (be sure to sign up for the newsletter while you're there). For collection updates and promotions, follow ILNP on facebook, twitter and instagram too!